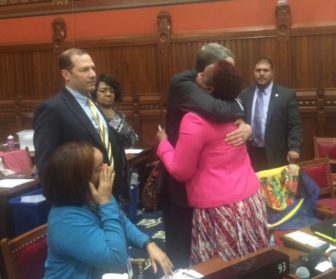 Rep. Robyn Porter, a survivor of domestic violence, is hugged by a colleague, Brian Becker, after passage of a domestic violence bill she championed. By a surprisingly strong vote, the House of Representatives overcame tenacious opposition from conservatives Wednesday night to pass a bill requiring gun owners to surrender their firearms within 24 hours of being served with a temporary restraining order in domestic violence cases. Current law requires gun owners accused of abuse to surrender their arms only if a judge issues a permanent restraining order after a contested hearing, leaving guns in the home during the volatile period when a victim may be exiting an abusive relationship. The bill passed and sent to the Senate on a vote of 104 to 42 would enact the same safeguards found in many other states: Firearms also would have to be given up during the pendency of a temporary restraining order. “It’s a small price to pay for the precious lives we might save,” said Rep. Mitch Bolinsky, R-Newtown. The weapons would be returned if a judge concluded there were no grounds for a permanent order. The bill was amended to require an expedited hearing of seven days when firearms were surrendered instead of the normal 14 days. Republicans Rob C. Sampson of Wolcott and Doug Dubitsky of Chaplin led the opposition, arguing against singling out firearms among other weapons and complaining that even temporary confiscation was a violation of due process and Second Amendment rights. “We’re decimating the rights of our citizens,” Sampson said. Rep. William Tong, D-Stamford, co-chair of the Judiciary Committee, said case law was well-established: There is a legal right to a hearing to contest a permanent court order, not a temporary one that lasts no more than two weeks. At least 20 other states have similar laws, including one of the bastions of gun rights: Texas. Rep. Al Adinolfi, R-Cheshire, said domestic violence victims can be bludgeoned, as was a relative of his, or stabbed. “So why are guns so important in this case?” he said. Tong replied that criminal laws already treat firearms as more dangerous than other weapons for obvious reasons: they are more lethal. He mentioned that his family was grateful that his mother was attacked by a robber with a knife, not a gun. She survived multiple stab wounds. Adinolfi, 81, who is not seeking re-election, chided Tong for emphasizing the legislation’s impact on women. Tong said he did not intend to suggest that men never are victims of abuse, but the statistics speak for themselves: From 2000 to 2014, there were 183 women and 32 men killed by their intimate partners. Women in abusive relationships are five times more likely to be killed if their abuser has access to a firearm, according to data from the administration of Gov. Dannel P. Malloy, who sought the legislation. Connecticut averaged 14 intimate-partner homicides a year form 2000 to 2014, with guns used in 39 percent of those 188 homicides. After Bolinsky announced his support for the bill and insisted the inconvenience to gun owners was minimal compared to the protection for domestic violence victims, Rep. Robyn Porter, D-New Haven, stood to speak. She is a survivor of domestic violence. With Rep. Caroline Simmons, D-Stamford, she worked to line up votes for the bill. She was the last to speak. Tong said later he saw no need to summarize the case for the bill after Porter’s speech. House Minority Leader Themis Klarides of Derby was among the 21 Republicans to vote for the bill. She dissuaded some of her members from prolonging debate, saying there was a line between principled opposition and dilatory tactics. Karen Jarmoc of the Connecticut Coalition Against Domestic Violence said the White House had urged the House leadership to call a vote on a bill that conservatives thwarted a year ago with a threatened filibuster. She called the margin of victory gratifying. House Speaker J. Brendan Sharkey, D-Hamden, said he had no intention of postponing debate for a second year, even in the face of another filibuster threat with only a week left until the constitutional adjournment deadline. Correction: As originally posted, this story did not note that the bill was amended to require an expedited hearing within seven days if firearms are surrendered.